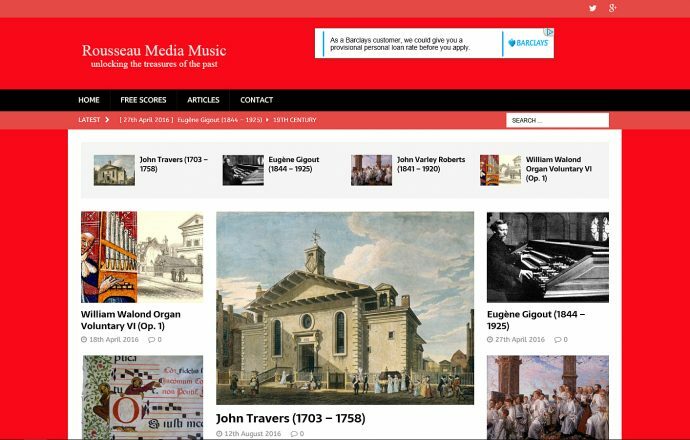 Something of a niche magazine for lovers of rare and unusual classical music, Rousseau Media Music was created by Senlac Hill Publishing to fill a gap in the market. There is a vast quantity of music in the archives of libraries and other collections that have no or few modern performing editions and are rarely if ever recorded commercially. Rousseau Media Music is on a mission to make at least some of this music more readily available, both to performers and listeners alike. This is done by making use of digital technology that enables a computer to access pre-recorded sound banks or libraries of instruments. It’s not of course the same as a real player or players giving real performances, but it does it least enable to music to be heard in a sound that approximates closely to a real performance. The magazine has a supporting YouTube channel called Rousseau Media Music where computer performances are uploaded on a regular basis. While the audio channel carries the performance, the video displays the music score so that those who read music can follow the notes as they are played. On the magazine site itself, there are articles about the composers and their music, and links to the relevant YouTube videos. The programme has started by mostly focusing on the work of English organists of the 18th century. Many of these were brilliant composers but were much overshadowed by the better known contemporaries, such as G F Handel and William Boyce. While some of the works by these composers have seen the light of day from time to time, usually in obscure and now difficult to find recordings, the vast majority of works remain largely and unjustly neglected.